Google Home Mini is dubbed as “small and mighty”, a smart speaker aimed at helping users access the Google Assistant anywhere in the house. Google sent us a Home Mini to check out for a hands-on, so let’s take a look at how useful this speaker is for an iPhone user. While Canadian users have had access to Assistant for iOS for some time now, in a speaker form means it’s always-on and always ready for your commands. You can get the latest news, weather, traffic, sports and more just by saying “Ok Google” and your command. Google Home Mini can also let you hear your schedule, your reminders, make calls and more, which means you need to be an invested Google user to make use of these features. For those with a Chromecast, Home Mini can be summoned to control the streaming media dongle, to either play music or media such as Netflix. 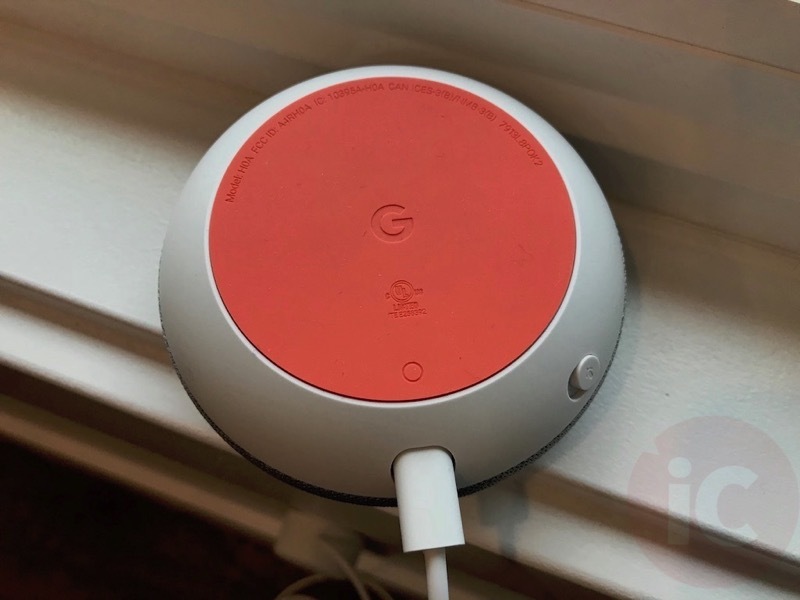 In our case, we don’t have a Chromecast but in our tests, we wanted to see how useful the Google Home Mini would be in our office for day to day use. For starters, the Google Home Mini has a small footprint and doesn’t take up a lot of space. The physical size and look of the device reminds me of a Pizza Pocket (remember those? ), but with a grey (Chalk) mesh fabric on our unit. The speaker has a physical mute button to disable the microphone (the LEDs glow amber) for times when you don’t want it listening, while four built-in LEDs adorn the top of the device. On the left and right sides of the speaker are touch controls for volume. Setting up the Google Home Mini was fairly simple. 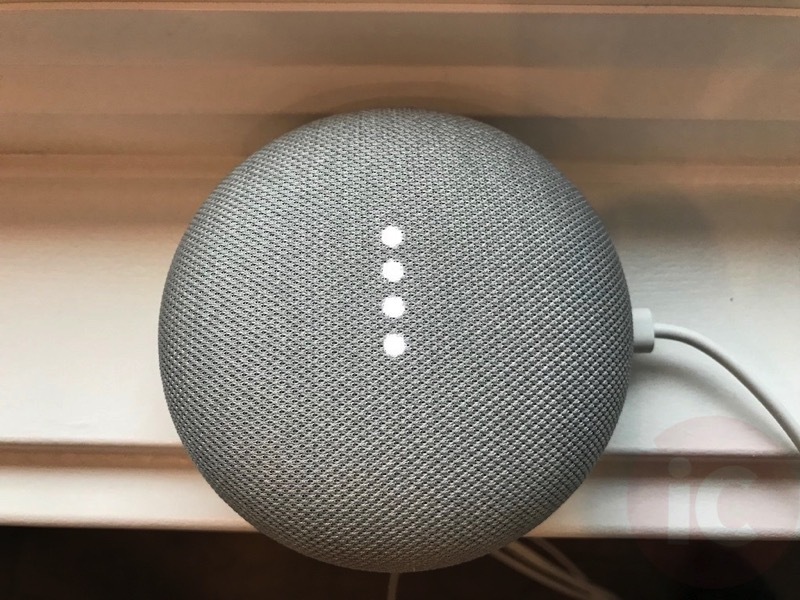 You just plug in the speaker to a power outlet and download the Google Home iOS app. The app will automatically detect your Google Home Mini, and guide you step-by-step through the setup process. 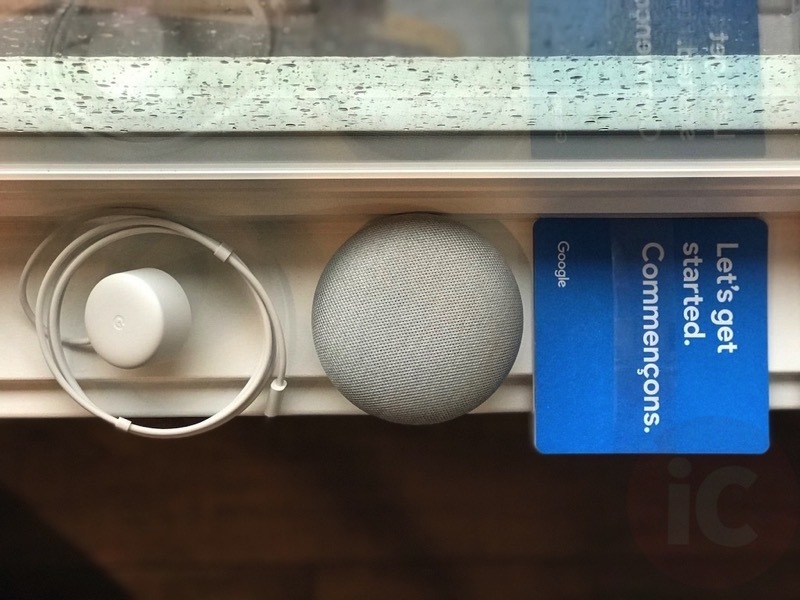 The setup will play a sound from your Google Home Mini to ensure you’re connected to the right device, connect to your Wi-Fi network, setup Google Assistant and teach it to learn your voice. Once that’s done, Google Home Mini will respond when you say “Hey Google” or “Ok Google”. So what exactly did I use this Google Home Mini for? I had it in my office and what I can tell you is the far-field voice recognition worked really well, better than Apple’s “Hey Siri” on iPhone and Apple Watch. Google Assistant is able to decipher words, phrases and questions better than Siri. It’s not even close. I was able to easily call on Google from across the room and it would hear my commands loud and clearly, even when slurring words sometimes (which Siri can’t handle; no I wasn’t drunk). 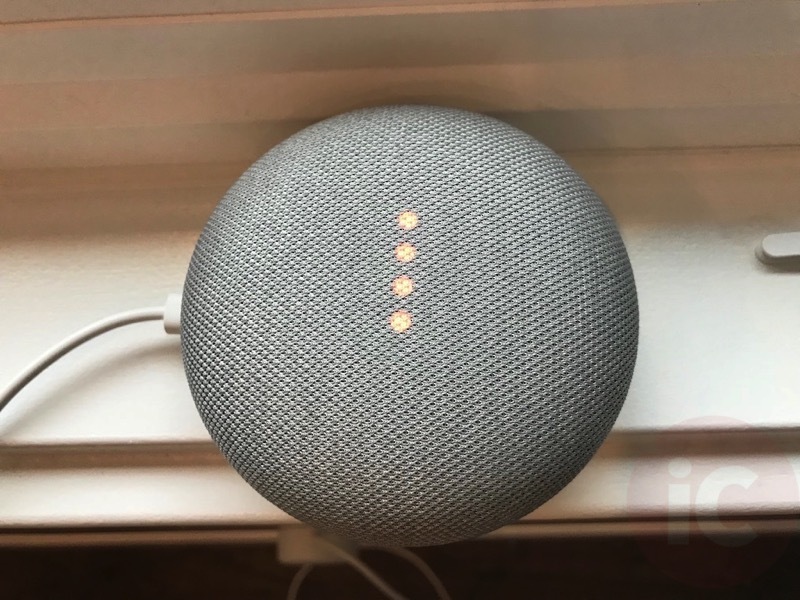 Google Home Mini was useful for playing music (it played Google Play Music stations), asking about the weather and reading news from sources like CBC News Hourly Edition and more. Google Home Mini also sent directions to my iPhone and the Google Home iOS app successfully, but I rarely used this, as all I do is sit in front of a computer at home and talk to you guys (sadly; okay not really, it’s awesome). As for speaker quality, it’s pretty basic with its “360 sound with 40mm driver”. There’s no bass at all with music and for a device of this size, it’s hard to expect impressive sound quality like you would from a Sonos One, for example. For phone calls, Google Home Mini can make calls for you and will show your caller ID. In my short tests, recipients said my voice was echoing and pretty much could tell I was talking in a room or on speakerphone. Since Google Home Mini doesn’t have a physical button to hang up calls, I rarely used the feature. Since most of our smart home products are based on Apple’s HomeKit, Google Home Mini cannot control them. But Google Home Partners have a longer list of products compared to HomeKit. The point of Google Home Mini is to have Google Assistant at your beck and call. It’s great for getting the news, short bursts of music, the weather and other tidbits of information when your hands are busy (like setting a timer). I found myself using it more often than Siri (who actually uses Siri?) in the office, despite always having my iPhone and Apple Watch with me. A recent update now lets your Google Home and Home Mini speakers act as intercoms in your house. 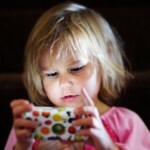 This will be big for those with large families to communicate. A list of what you can do with Google Home Mini can be seen here. Update: Yes you can call Canada and U.S. numbers over Wi-Fi at no charge. 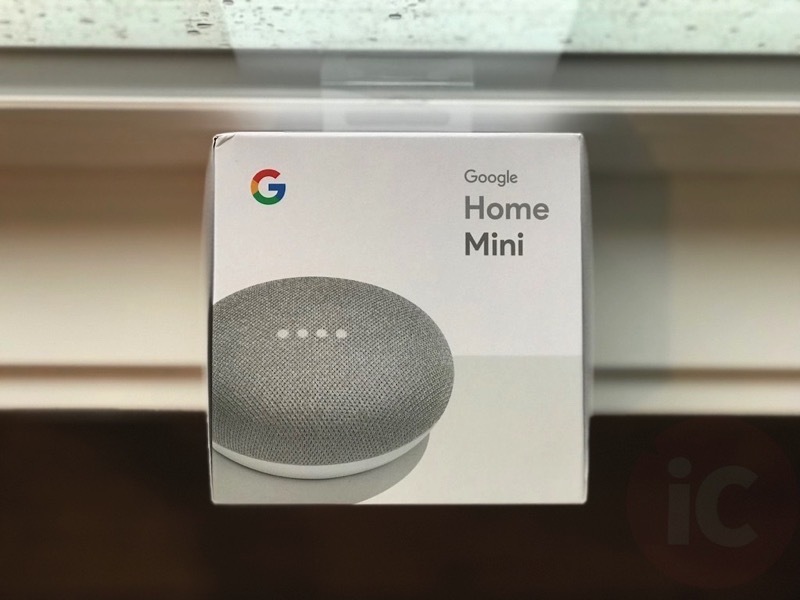 Google Home Mini retails for $79 CAD from Google–but the war is on to get consumers to buy these en masse, especially with Amazon’s Alexa coming to Canada next month, and Apple’s HomePod being delayed to 2018 (who knows when Canada will even get HomePod). 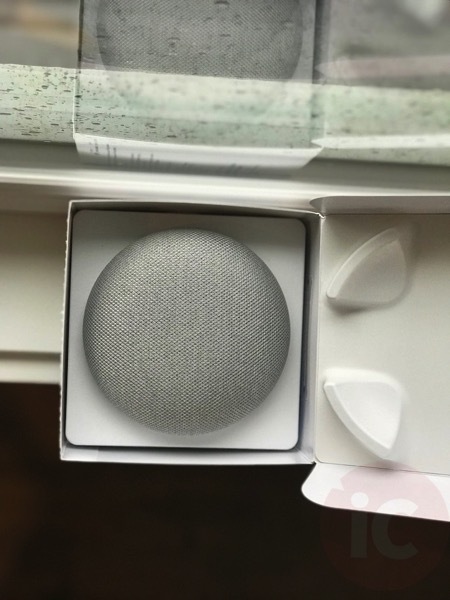 Google has Canadian retailers pricing Home Mini speakers aggressively for Black Friday, with places like Best Buy carrying them for $39.99 CAD (updated). At that price, it’s definitely worth picking up if you’re okay with Google listening in and learning all your voice commands.